Microsoft announced today a new SDK to help monetize your Windows Phone apps. This SDK, called Ad Mediator allows you to integrate multiple ad providers into your app. We all know that PubCenter has not been performing well, even Microsoft. So, the tools team built this SDK to help developers easily earn money through ads. This is not a new concept. Windows Phone has had the AdRotator control for some time. 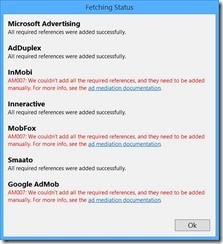 The Ad Mediator will cycle between any of the ad providers that you configure. You are not guaranteed to get 100% fill rate. You are not guaranteed to get high eCPM. But you are guaranteed that if one provider does not have an ad, another provider will be used. I’m not going to go over this topic except to say to follow the documentation online. I found that there are some things you need to be careful of. You must download and install the ad provider SDKs before configuring Ad Mediator. You do not need to download the SDKs for PubCenter, AdDuplex, Smaato, or Inneractive. These are available as NuGet packages and Ad Mediator will install them fine. For all other providers, download the SDK and manually reference the assembly.If you do not, you will see this dialog with configuring. You must add the required capabilities to the manifest file. Ad Mediator will not modify your manifest file. If you do not add the required capabilities your app will crash when Ad Mediator tells the provider to get an ad. Some ad providers take time to validate your account or app. You will not be able to see ads until this is complete. Some providers require a link to download your app. You will not be able to see ads until this is complete. 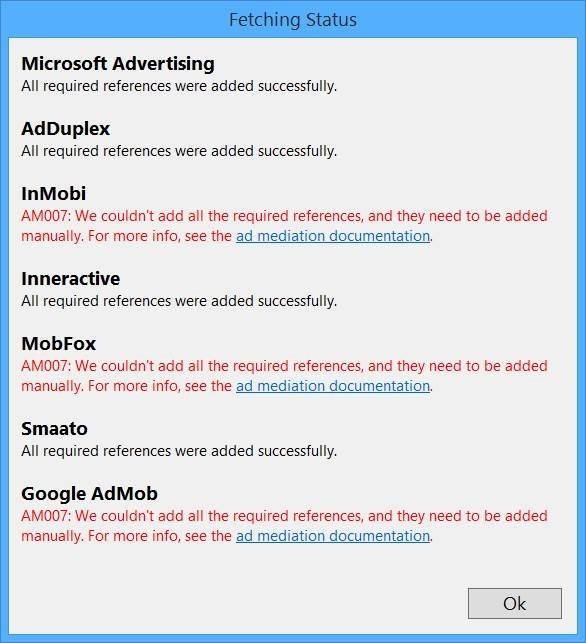 Ad Mediator works great for Windows Phone Silverlight apps. For Windows Phone Runtime (XAML) apps, only three providers are supported. Refresh rates must be between 60 – 120 seconds. This is just silly. If I want my ad to change at 30 or 45 seconds, I should be able to. You have to add the control to your page from the toolbox and drag it onto the designer. You will only see test ads when running in the emulator. Dev Center seems to have hard coded values for percent distribution. Here’s the problem. I uploaded an app with five providers. One of those I only want to use as a back up and the others 25% each to try them out. 25% is not an option. I can choose 20 and I can choose 30, but nothing in between. These values may change based on the number of ad providers you configure. So if you configure three, maybe 33% is an option. However these numbers are set, it needs to change to allow for equal distribution in these cases. When you update your app after you have already added Ad Mediation, you have to set the distribution again! You’d think this would keep the values.